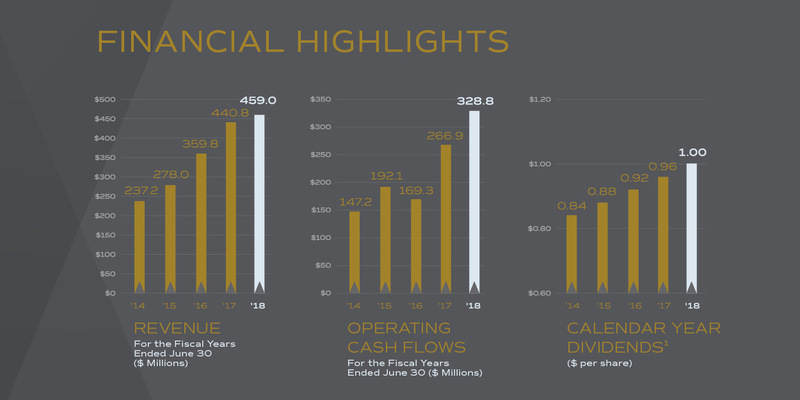 Royal Gold's compounded annual growth rate over the past decade (June 30, 2008 through June 30, 2018) for revenue and operating cash flow was 21% and 24%, respectively. These financial results were derived from our interests in 38 active mining operations which provide portfolio diversification and revenue stability. Higher average metal prices for the majority of the decade also contributed to our strong performance. Royal Gold has a strong balance sheet and, combined with our growing cash flows, is well positioned for future growth opportunities. In addition to our current portfolio of 41 producing assets, the Company also holds interests in 17 development properties where reserves have been identified and efforts are being made by the various operators to develop the properties. Dividends are paid on a calendar year basis. The dividend for calendar year 2018 was $1.00; the dividend paid during the fiscal year 2018 was $0.99.